Spread Your Wings into Spring! Transform from the Inside OUT! March, the beginning of Spring, a time of Transformation within and without! A time to come out of the cold hibernation of winter, and into the colorful, warmth of spring. During this hibernation period, many of us reflect on who we are, what we want to accomplish, or what we want to let go of. We do an internal spring cleaning, so to speak, to start the new season re-energized and positive. 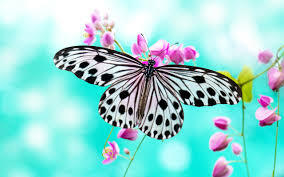 Just like the butterfly, we shed our cocoon, and emerge with beautiful wings into Spring! It all sounds beautiful and makes sense, but that time we spend in our cocoon hibernating can be torturous! The internal growth we experience isn't easy, letting go isn't easy- shedding old pain, negativity, and people or situations we've realized are toxic can be painful. Once we do let go, that's when Transformation takes place. That's when the cocoon falls off, and we transform into a beautiful butterfly. I invite you to ask yourself, what are you holding onto that's holding you back from spreading your wings and flying? What do you need to let go of in order to move forward? Is it a relationship, a job, a negative belief, or maybe something from your past? Whatever it is, KNOW, that it doesn't have power over you. You have the strength to face it, and let it go! You will find freedom in letting go, and this will allow you to spread your beautiful wings and fly! Transform by gifting yourself or a loved one with a session!